Welcome to the world’s largest range of mini sclera contact lenses and blind eye contact lenses. Popular among those looking for a more extreme eye transformation than can be achieved with a regular pair of coloured contacts, our mini sclera and blind eye designs our extremely popular among die hard Halloween enthusiasts, professional SFX artists, experienced cosplayers and even TV and movie production companies. Headlined by our bestselling white, black and red block colours, our extensive range of mini sclera and blind eye contacts also incorporates a number of movie inspired designs. For example, our hugely popular Nun Mini Scleras Contacts have been painstakingly designed for those looking to recreate makeups and costumes based on the hit movie. Our black mini sclera lenses are another popular choice, ideal for use in Michael Myers makeups and costumes, they feature a black block design and completlely cove your natural iris and pupil. What’s the difference between regular contacts, mini scleras and full scleras? Regular Contacts – Measuring 14mm in diamter, these are the lenses worn by more than 90% of users in the US. 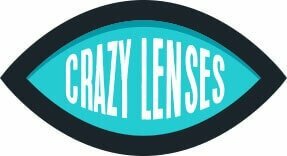 Freely available, affordable and easy to fit and remove, they are most often manufactured as soft lenses for increased comfort and manoeuvrability. 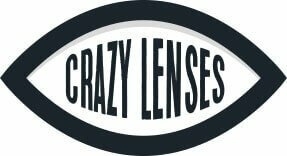 Mini Scleras – Typically measuring 17mm in diamater, mini sclera lenses are sometimes also available as 14mm lenses with a larger printed area than regular contacts. They provide a more extreme eye transformation than regular contacts, but are considerably smaller, safer and cheaper to buy than full scleras. They are a huge hit with Halloween revellers as well as amateur and professional SFX artists. Full Scleras – Given the extent of transformation that can be achieved, full sclera lenses are a huge hit with movie production companies and professional SFX artists. Mesuring 22mm in diamterm, they completlely cover your natural pupil, iris and sclera. Given their size and the fact that there’s potential to cause serious damage when menouvering them in an out of place, they should only be worn in conjuction with an optemotrist or eye doctor. 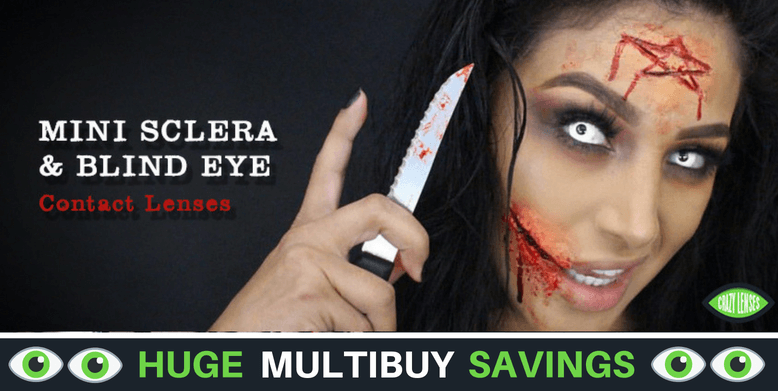 Mini Sclera Black – Great for use in whole host of looks, our black mini sclera lenses are especially great for use in SFX makeups and for replicating the killer eyes of Michael Myers form the hit movie, Halloween. Mini Sclera Yellow (Demon Nun) – Designed to replicate the yes of Hollywood’s most famous Nun, these yellow mini sclera lenses feature an off-yellow block colour and central black pupil. Launched in late 2019, they’ve quickly grown to become one of our bestselling mini sclera lens designs.